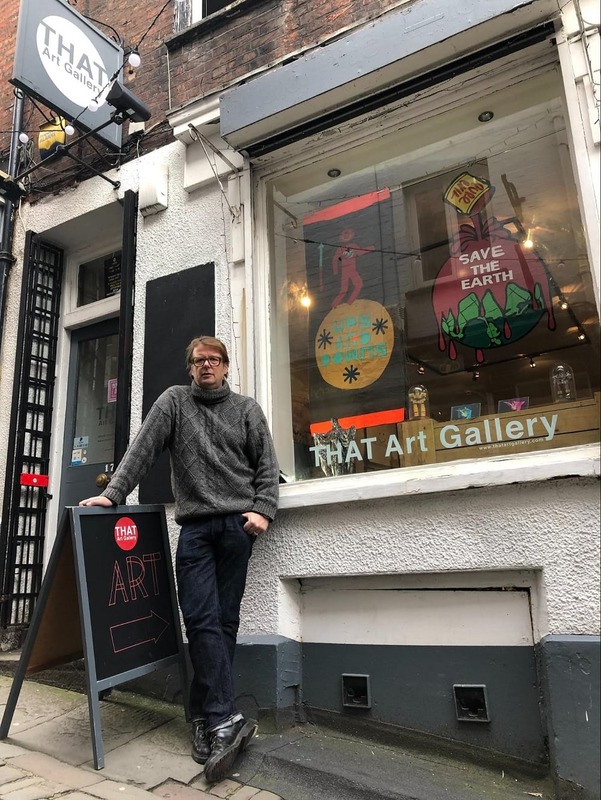 Andy Phipps is the founder of That Art Gallery – one of Bristol’s most exciting contemporary art spaces. He’s also a selector for the forthcoming Friends of the RWA Biennial Exhibition 2019. What’s the story behind That Art Gallery? I moved back to the area about six years ago, after more than 20 years in London. I studied fine art and have had a varied career as a designer, art director and project manager, always within a creative environment. Shortly after we moved to Bristol I curated a couple of pop-up exhibitions in The Crypt of St John the Baptist (Quay St) with artists Jess Albarn and Beau Stanton, both of whom I’d known and worked with previously. It was the response and reaction from visitors to these exhibitions that prompted me to consider opening a permanent gallery space. It amazed me then (and now) that given the number of artists and creative people in Bristol there’s a shocking lack of spaces to exhibit. What do you look for in an artist, when deciding to host an exhibition? Primarily I’m exhibiting works by artists who I like! I’ve got a varied taste and subsequently there will never be a gallery ‘style’ – if I stick to this policy I hope that I’ll eventually exhibit someone that other people like too?! I tend to exhibit artists who are skilled and passionate about what they create. I’m interested in what drives individuals to have a need to make art and hope that I can convince local people how important it is to support artists before they’re lost in a increasingly cynical and creatively stifled society. What does the RWA mean to you? The RWA is an incredibly valuable space for the artists and art lovers of Bristol. The worth of institutions like this cannot be over emphasised. I believe it’s vitally important for people to reference what’s been made in the past but (without getting too political) it’s increasingly important that institutions like the RWA continually look to the future. Sadly, so much of our art education is under threat – the RWA is doing a great job in inspiring creativity and participation in making art to a wider audience. How did you come to be involved in judging the Friends’ exhibition? I was asked! It was a great affirmation that I was on the radar of Bristol’s creative community. I’m really proud to be playing a small part within such an illustrious establishment. What are you hoping to see in the Friends’ exhibition? I’d hope to see an amazing variety of works and think that my incredibly eclectic taste will make me ideally suited to the role of selector. If you’re reading this and you’re not yet a ‘friend’ (and the submission date has not yet passed) I’d advise you to become a friend ASAP – for the £35 fee you could not only visit every exhibition for a year, you may also get a chance to be exhibited in one! How are you finding the visual arts scene in Bristol? It’s brilliant how many artist studios are in the city and for every artist with a specific workspace there would appear to be 10 more working from home and involved in one of the neighbourhood art trails. Being a small independent gallery I need to keep overheads to a minimum. This year I’ve exhibited a number of local artists – it’s a great way of establishing connections whilst keeping logistical costs down and with such a rich supply of talent I’d be foolish not to! Hopefully the reputation that I’m developing amongst the creative community will spread to the art buyers in Bristol. That Art Gallery is commercial and needs to sell art in order for the gallery to survive. I’ll have been open two years in March 2019. I hope that more people are beginning to know about the gallery and appreciate what I’m trying to achieve. That Art Gallery is at 17 Christmas Steps, Bristol, BS1 5BS. Opening times: 11am – 6pm, Tuesday to Saturday. The Friends’ Biennial Exhibition 2019 runs from 13 April – 12 May 2019 in the RWA’s Cube and Link Galleries. Free entry.